This article is about the ending video entitled "Birth by Sleep". You may be looking for the PSP game. The mysterious warriors, Terra, Aqua, and Ventus face an unknown threat. "Birth by Sleep" is the secret ending video to Kingdom Hearts II Final Mix and a follow-up to "The Gathering", the secret ending video to the original Kingdom Hearts II. The video centers around three armored warriors wielding Keyblades and an unnamed foe. It is a teaser for Kingdom Hearts Birth by Sleep. Picking up where "The Gathering" left off, the three Keyblade knights, Terra, Aqua and Ventus are approached by an old man, Master Xehanort, and his apprentice, Vanitas. The two are charged by Terra, and Xehanort responds by shifting the earth beneath them to create a rising plateau that carries Terra above the rest. Xehanort then lifts the ground beneath himself as well, creating a cliff much higher than the surrounding terrain. While Vanitas strikes Terra with Thunder, and is immediately pursued by Aqua and Ventus, Terra chases after Xehanort, who creates a Keyblade infused cyclone to aid Vanitas against Aqua and Ventus. Vanitas chases and battles Aqua and Ventus on the cyclone, and neither are able to overcome him. Noticing that Terra is getting closer to Xehanort, Vanitas directs the cyclone towards Terra, knocking him off the cliff. Aqua and Ventus watch in horror, and Aqua gets hit by the cyclone, crashing to the ground, obliterating her helmet completely. Ventus comes to her aid as she casts Reflect magic on Terra to protect him from the cyclone. The spell protects him from the cyclone until the he is pushed up to where Xehanort is, at which point it explodes, blasting the cyclone to pieces. Terra is dropped to where Xehanort is. Terra briefly duels Xehanort until the old man freezes his left arm. Ventus attempts to attack Xehanort from behind, but Xehanort teleports himself behind Ventus and grabs him by the helmet, beginning to crush it. Terra stumbles forward, probably in an attempt to help Ven, until Vanitas and the Keyblade infused cyclone inexplicably reappear below Terra's feet, hurling him off the cliff as countless keyblades batter his body. Xehanort and Vanitas stand at the top of the cliff, still holding Ventus, presumably so Aqua could see him. When she does, Xehanort first burns and then freezes Ventus. As Aqua looks on in horror, Xehanort throws him off the cliff, and his Keyblade shatters on a rock. Aqua catches his body and he is revealed to have a striking resemblance to Roxas. Though frozen, he moves his eyes to indicate that he is still alive. Xehanort's Keyblade is changed into a purple and blue ball of flame-like energy, which he shoots upwards to part the gathering dark clouds, revealing Kingdom Hearts. Terra, barely able to stand, tears off what remains of his helmet to look up at Kingdom Hearts and begins to succumb to the darkness, shown by his eyes turning yellow. The video ends with Mickey Mouse looking at the battlefield from a distance, holding the Star Seeker Keyblade and on the verge of stepping in to fight Xehanort and Vanitas. Beginner Mode - Not accessible. Standard Mode - Beat the game, complete Jiminy's Journal, all Gummi Missions, and get the Gold Crown. Proud Mode - Beat the game, complete Jiminy's Journal, and get the Gold Crown. Critical Mode - Beat the game and get the Gold Crown. Although the climactic scene of Kingdom Hearts Birth by Sleep was designed after this video, there are several changes and omissions in the final version. Vanitas jumping off the cliff and using Thunder on Terra. Vanitas using Blizzard on Aqua, and Ventus attacking Vanitas from above. Terra attacking Master Xehanort when he falls from the explosion, followed by Master Xehanort using Blizzard on Terra's left arm. Master Xehanort cracking Ventus's helmet after he picks him up, and pieces breaking off. Ventus's Keyblade shattering against the rocks. Terra's eyes turning yellow after he removes his helmet. 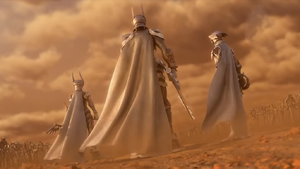 Terra, Ventus, and Aqua no longer wear capes, due to frame rate issues in the final video. Ventus holds the Wayward Wind with his right hand, and the guard and teeth of the Keyblade are now on the same side. Tetsuya Nomura, the head storyline designer for the Kingdom Hearts series, originally gave very few details about the secret ending. Originally, the only information he disclosed was that all the characters in the video were new to the series, despite any physical resemblances. The time and place of the video were all left ambiguous as well. However, Nomura stated in a Famitsu interview that the video was the non-playable ending of Kingdom Hearts Birth by Sleep, and took place ten years before Kingdom Hearts. In a May 2007 interview dubbed the "Scenario Mysteries Interview", Nomura revealed more insights into the video and its implications for the series. He confirmed the names of Aqua and Ventus and introduced the name of the third Keyblade knight, Terra; however, he also stated that Ventus was only a nickname for the young male knight, and that the full name was "a little bit longer" (Ventus). "I can't give any specifics about that. He may just resemble him, and if there is a connection, Sora may be related too. What I can say right now is that these mysteries are all connected to the story." He also gave no details regarding the change in color of Terra's eyes from blue to yellow, saying "I think everyone's imaginations are pretty capable so please try and anticipate a lot of things." His final comments regarding the three warriors' names were that the names of Sora, Riku, and Kairi are meant to signify Sky, Land, and Sea, while the names of Ventus, Terra, and Aqua represent three different properties of the world: Wind, Earth, and Water. The Keyblades littering the Keyblade Graveyard include the Follow the Wind, Fenrir, Wishing Lamp, and Sleeping Lion, as well as several Keyblades with new designs. ↑ Tetsuya Nomura: We wanted to make it so that as many people could play together as possible, but in the end we could only do six. By the way, in the Kingdom Hearts II Final Mix secret movie you can see Terra in his armor with a cape, but we took off the cape in this game. It was to make processing easier when you're playing with six people. Processing of moving fabric can be slow, so the speed it runs at is completely different if he has a cape or not.